Filtering by Category: "Media 2.0"
Added on June 1, 2008 by Chris Saad. I have written on my personal blog about what I am starting to call "Personal Reality". Personal Media includes your friend's shared items. It includes the comments you leave on blogs. It includes Social Media. But it also includes private updates. Updates from your Intranet. Updates from your family. Updates from broadcast media. Updates that matter to you - no one else. 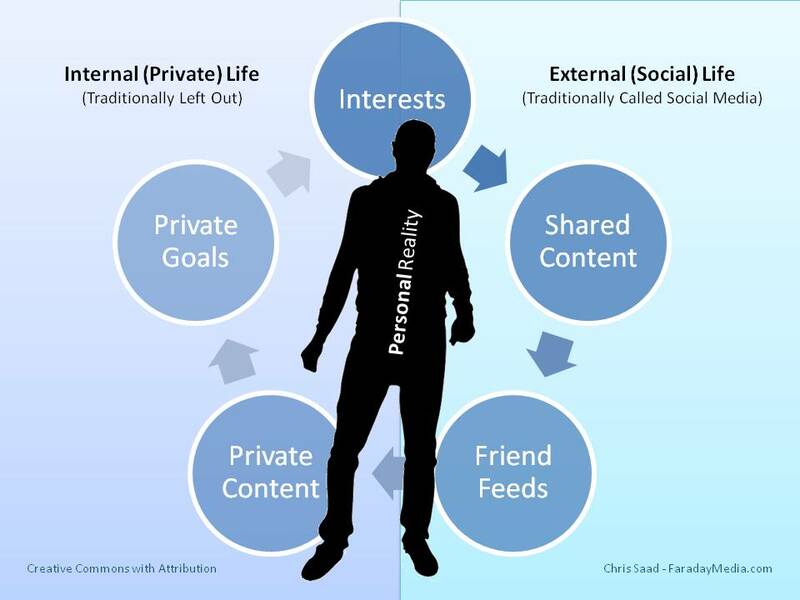 Personal Media is about recognizing that people are social and private. They are interested in personal experiences. In "APML", "Media 2.0", "dataportability", "personal reality", "personal relevancy", "trends"
Added on February 20, 2008 by Chris Saad. Last night (PST Time) we had our first Steering Group Teleconference. It was great, productive call with lots of outcomes that are currently being implemented. We also agreed to meet in a similar way every 2 weeks. Listen to a recording of the call hosted here on John Breslin's blog. Thanks to everyone who organized and participated. In "APML", "Media 2.0", "audio", "dataportability", "podcast", "steering", "teleconference"
Added on February 13, 2008 by Chris Saad. DataPortability San Francisco Meetup Feb 7th 2008 from dataportability on Vimeo. In "APML", "Media 2.0", "dataportability", "media 2.0 workgroup", "meetup", "video"
Added on February 6, 2008 by Chris Saad. Time to continue the conversation about DataPortability... this time using video. We want to hear your thoughts about DataPortability recorded as a short video. We hope to share these videos individually as well as compile them into a single video to help the community understand expectations, goals and themes that are emerging in the discussion. Here are the questions we'd like you to answer. What does DataPortability mean to you? How do you imagine DataPortability might change the way you use the web? How would you explain the value of DataPortability to Vendors - those that store the data. How would you explain the value of DataPortability to Users - those that create and own the data. Ideally, what would you like to see from the DataPortability Project in the next 12 months? 24 months? What else would you like to say? Make up a question and answer it! Finally, if you agree with the sentiment, please say "My name is [your name] and I want Data Portability" at the end of your video. If you can, please try to limit the video to a maximum of 5 minutes. We'd like to compile these for February 20th. Please make sure you get your video in before then! I look forward to seeing what the community has to say. Special thanks to Daniela Barbosa, Chris Messina and the Evangelism Action Group for this idea! In "APML", "Media 2.0", "announcement", "community", "dataportability", "project", "video response", "video"
Added on January 15, 2008 by Ash. My lovely wife (who is an Economics and Business teacher coincidentally) sent me a Podcast today which really blew me away. It's an interview with Andreas Kluth (San Francisco correspondent for The Economist) talking about real and virtual campfires, and predicts the dissolution of standalone social networks as we know them. Anyone interested in the next generation of internet technology really needs to listen to this podcast. Its clear, concise and really gets at the heart of many social graph issues and human behavior. In "APML", "Media 2.0", "Social Networks", "dataportability", "economics", "portabale social networks"
Added on December 13, 2007 by Ash. With some hilarity, I present: Russian computer program fakes chat room flirting. Internet chat room romantics beware: your next chat may be with a clinical computer trying to win your personal data and not your heart, an online security firm says. I find this both hilarious on a number of levels, but it illustrates so perfectly about how valuable (as users of the interwebs) our attention data is. It's so valuable that some smart people have written what can really only be described as a Trojan horse for attention data! PC Tools senior malware analyst Sergei Shevchenko says the program has a "terrifyingly well-organised" interaction that could fool users into giving up personal details and could easily be converted to work in other languages. "As a tool that can be used by hackers to conduct identity fraud, CyberLover demonstrates an unprecedented level of social engineering," he said in a statement. "It employs highly intelligent and customised dialogue to target users of social networking systems." This also highlights the need for the general public to be more conscious and aware of their attention data, how to obtain it, how to control it and how to move it. It clearly demonstrates the value of the data we allow companies and products to collect about us with little or no hesitation. We allow these companies to collect whatever they like, without even letting us have a glimpse of what inside their walled gardens. It's long past due that we all stood up and asked them to open the doors. It's time we all started demanding Data Portability. In "APML", "Media 2.0", "dataportability"
Added on December 3, 2007 by Chris Saad. If you like Particls, Engagd, APML, DataPortability, The Media 2.0 Workgroup or handsome men from Australia please vote for the company that created them all! To recognize a site that is making an important social impact in the world. Site does not need to be a non-profit to qualify. In "APML", "Media 2.0", "competition", "vote"
Added on November 28, 2007 by Chris Saad. Are you a creative person? Want your logo/image used on thousands of sites? Help create the badge that will represent the data portability movement over on DataPortability.org. Upload your ideas to flickr and join in the fun. First prize is the love and admiration of the entire world. In "APML", "Media 2.0", "badge", "contribute", "dataportability", "logo"
Added on October 18, 2007 by Chris Saad. I've decided to try to resurrect my personal blog - so if you'd like to follow along check it out over here. Are you looking for money? My answer has changed dramatically over the life of Faraday. It has gone from "Looking for money? What you mean on the street?" to "Are you kidding, we would love any money - how about $10, do you have $10?" and then to "Sure we are raising a round, we have [insert great elevator pitch here]". It then shifted to "Really? Is that all you got?" and so on. Since some of the most recent developments in the product/business strategy and the great adoption rate of APML has become clear the question "Are you looking for money" has been raised a few more times. Most recently though, my answer has changed again. My answer now is "No, but we are looking for partners". In "Media 2.0", "business", "off topic", "ot", "personal", "web 2.0"
Added on August 23, 2007 by Ash. "MySpace and MTV say they have joined forces to let candidates for the US presidency individually discuss ideas and issues with young people in online webcasts." This sort of news really excites me becasue its seems, like never before just as the audience has the power in the web, the world can now have the power over governments. I'm sure there are many people who will complain about the potential bias of MySpaces cooperate linage - but I am of the optimistic belief that any conversation, especially political direction and debate is ultimately positive. Its a perfect example I think of social media reaching out to the masses, giving people from all walks, the chance to be heard. It also got me wondering, how would have the 60's, 70's and 80's been different if we had Social Media and Social Networking resources back then? I wonder if Social Media might put us on path to finally start getting over our differences and start getting the work that needs to be done; done? In "Media 2.0", "Social Networks", "mtv", "myspace", "politics", "social media"
Added on July 31, 2007 by Chris Saad. Our forum system for Particls is powered by Tangler.com. If you log on to provide us feedback you will find a real-time chat/forum hybrid full of AJAX goodness. Tangler is starting to venture out of the shadows and has recently been reviewed on Techcrunch. The ability to span Synchronous and Asynchronous conversation puts Tangler in a category all on its own. Jump in at any time, or discuss in real-time. Join the conversation late? No worries, read back through the archived history. The real power of Tangler becomes clear, however, when you look at the distributed nature of the system. One conversation, many 'windows'. You can particupate from the Tangler UI, in an embedded chat room on another site or on a widget somewhere. Check out our Tangler group to get started. In "AJAX", "Media 2.0", "discussion", "forums", "martinwells", "support", "tangler", "web 2.0"
Nominate Particls for being so cool! Added on July 15, 2007 by Chris Saad. Do you think we are cool? Of course the least cool thing you can do is say you're cool. So we would never say we were cool. That would just be uncool. But maybe you can say it for us? Nominate Faraday Media (the company that brings you Particls) for the Anthill Cool Company Awards. In "APML", "Awards", "Media 2.0", "anthill", "attention", "competition", "particls"
Added on July 3, 2007 by Chris Saad. There's been a mad rush to Facebook latley so we have joined in the fun with some groups of our own. Join the APML Group and the Media 2.0 group (Thanks to Marianne!) to get involved. In "APML", "Media 2.0", "community", "facebook", "web 2.0"
Are you a Peepel Person? Added on April 3, 2007 by Chris Saad. The original genesis of the idea for Touchstone came about when I was working on Web-Based Enterprise software back in the day (you know... Those Web 1.0 days?). The issue very quickly became apparent to me that if you wanted to display an alert like Outlook routinely does from a web-based CRM or CMS system, you were in trouble. There was no convenient way to do it. So the question arose in my mind... "How can you alert the user to stuff". Then other questions followed... "how do you build a unified alerting tool that worked for all applications - not just the ones I was making" and then "how do you keep the user in control of all this alerting without overburdening them with a rules engine". The result is Touchstone. It's scope has expanded to handle news and content discovery and all sorts of other things, but at its heart, it is still a way to get messages from the web, to the user - on their own terms. Enter Peepel (Disclosure: Peepel and Faraday share an investor). At its surface Peepel looks like the newest player in the Web office suite marketplace. What it actually is, is a realization that online environments need to be platforms. Just like Windows is a platform for other software on the client-side. In the diverse coverage that it's getting today and over the next few weeks most blogs will probably focus on the office stuff. But I actually think the most interesting part is the environment that is being built out to support the applications themselves. Windowing, File Handling, Task Manager etc. One of the pieces of that environment will be Notification. And notification is what Touchstone is all about. "A document in your workspace has just been updated..."
"A spreedsheet you are monitoring has been updated..."
"Chris Saad has logged onto Peepel..."
So I look forward to see Peepel grow into its own and establish a viable platform inside which a whole range of applications can live - and notify - for the user. In "Media 2.0", "ideas", "integration", "notification", "office", "peepel", "touchstone", "web 2.0"